Post-Rodeo Road Trip is when the Spurs have historically shown what they’re really about. The San Antonio Spurs enter the home stretch in an interesting position. This is often the time when they really gel and gear up for the playoffs, and with a few exceptions how they do in this final stretch has often been indicative how the postseason plays out. However, what makes this a unique run for the Spurs is there really isn’t much to play for in March and April. It will either take a miracle run and epic collapse by the Warriors for the Spurs to capture the first seed (although they do play them twice at home in March), and the same is true if the Rockets, who are five losses back from the Spurs, hope to steal the second seed. That leaves cohesiveness, confidence and health as the Spurs’ main targets heading towards the playoffs, and they showed signs of each during the second half of the RRT. They’ve also left Gregg Popovich with some interesting decisions to make, like whether to stick with Dewayne Dedmon at starting center with defense and athleticism in mind, go back to Pau Gasol, who provides more spacing and shooting for a unit that can get stagnant at times, or take the Tiago Splitter/Boris Diaw route and go with whoever fits the match-up better. Regardless, with the embarrassment of riches and lack of selfishness the Spurs have in big men, it’s a good problem to have. The Spurs kept their starting lineup (with Dewayne Dedmon at center) together and Pau Gasol looked pretty comfortable coming off the bench in his first two games back, scoring 32 points (making all five of his 3-point attempts) and grabbing 18 rebounds in two wins at Staples Center. Now the Spurs have just eight road games remaining, with just five one-game trips in the month of March. They have the league’s best road NetRtg (plus-8.2 points per 100 possessions), but LaMarcus Aldridge has been a much better shooter at home (effective field goal percentage of 56.5 percent) than on the road (46.3 percent). San Antonio Spurs (2-0): Only Congressional action will stop the Spurs from reaching the 50-win mark for a 20th straight season overall and 18th consecutive non-lockout season. By contrast, the entire Atlantic Division, over the same time period, has a total of 10 teams record 50-win seasons as division winners. It wasn’t the greatest Rodeo Road Trip in franchise history, but a 6-2 effort lives up to Spurs standards pretty well. They’re making Golden State work for that No. 1 overall seed in the West despite the fact Pau Gasol missed a month with a broken hand and LaMarcus Aldridge is carrying his lowest scoring average (17.4 PPG) since his rookie season. 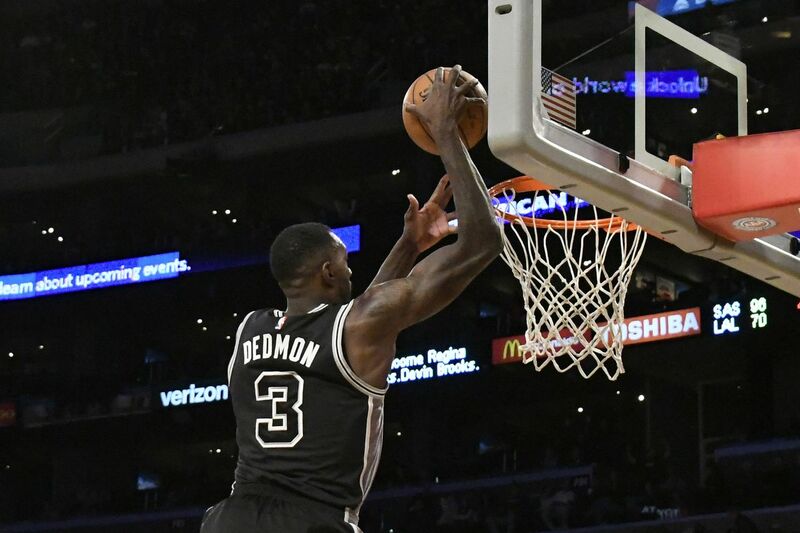 (The dirty secret there, of course, is that Dewayne Dedmon makes San Antonio so much better defensively when he’s playing in Gasol’s spot.) Since the Rodeo Road Trip concept was introduced during the 2002-03 season, San Antonio has a better winning percentage (.704) in those games (88-37) than they do in all other games under Gregg Popovich (.694). There are no burning questions. There are only Spurs. It’s been more of the same, consistent dominance from these guys. Enjoy what’s probably going to be Manu’s last ride. The Spurs, who sit comfortably in second place in the West, still 4½ games behind the Warriors and 3½ games ahead of the Rockets, clinched the franchise’s 20th straight postseason berth with a win over the Pacers (Feb. 14). Do you realize they’re barreling down on their 20th straight 50-win season, and 25th out of 28 seasons? What is that? Who does that? Don’t bring me the Patriots. Keep the Patriots. The Spurs have put together an unparalleled streak of success.